Located just outside of Ibiza Town, on Ibiza’s south east coast, holidays to Cala Talamanca are ideal for those wanting to enjoy the quieter side of the island. The town is built onto the hillside and offers spectacular views over the sheltered harbour, which is full of soft white sands. Families and couples will love the opportunities to relax, with sports and activities in the nearby towns and countryside surrounding the town. Foodies will find plenty to enjoy on holidays in Cala Talamanca, including little bistros and family run restaurants serving up fresh fish, lobster, prawns, and more. Wander along the boardwalk and take in the views of the Atlantic Ocean and its white sands, before finding your favourite luxury beach club. Spend the day ordering gourmet dishes and delicious drinks straight to your lounger, or simply soak up the sun as you relax with a good book. Cala Talamanca is said to be the upmarket sister of Ibiza Town, which is located just two kilometres away. It’s full of exquisite restaurants and bars, some of which have Michelin stars, as well as the odd celebrity or two. Relax in one of the trendy bars dotted throughout the town, or spend the day ducking into one of the many boutiques where you can find unique items made by local designers. Book your luxury holidays in Cala Talamanca with Sovereign, and we’ll help you find the perfect hotel for your trip. 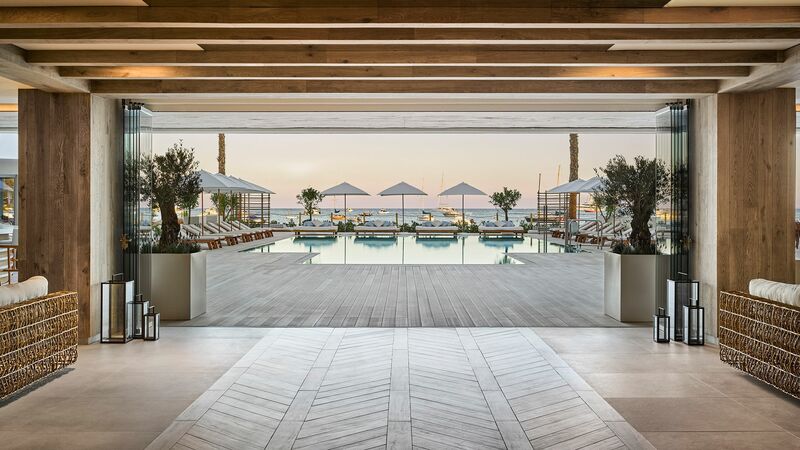 Choose to stay at the Nobu Hotel Ibiza Bay, where you will find all the facilities and amenities you’d expect of this luxurious brand. It’s home to clean and contemporary furnishings and architecture with rustic details, as well as two swimming pools overlooking the white sands of the beach. Onsite, Ibiza’s only Nobu Restaurant offers typical Nobu-style Japanese fusion cuisine with Ibizan inspired flavours, and there are also two bars and a beach club. Children will love the Kids’ Club, which includes unique activities like DJ workshops and there is also a spa and nail salon. Transfer time from Ibiza airport to Cala Talamanca is approximately 15 minutes.